He's a shady drifter who lurks in the shadows, waiting for his prey to make a mistake; Frank Castle is out to punish those he deems responsible for his misfortunes. Click here to play! Join The Punisher in his quest for justice and earn massive cash payouts in the process. The Punisher is an exciting new slot machine played across five reels and nine lines, with the more lines activated increasing your payouts on winning combinations. 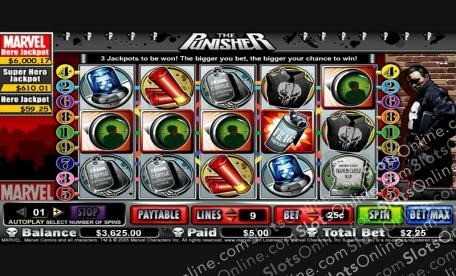 The Punisher can be substituted for any other logo on the reels and will pay out up to 5000 times your initial wager. Additionally, if you spin him up on reels 1 and 5 then you will receive the Free Game Bonus. Logos are Scattered and trigger the Villain Hunt Bonus Game when three or more appear at once. The Punisher is waiting for your help; will you heed his call and earn your winnings? The Punisher Logo is Scattered and will grant you the Villain Hunt Bonus Game when three or more appear at any one time. The Punisher is the substitute and will pay out up to 5000 times your initial wager. Additionally, a Free Game feature is triggered when he appears on reels 1 and 5. The Bonus Game is activated when three or more Scattered Logos appear. Once inside, the lucractive Villain Hunt will take place.